Sorry, price is no longer free! 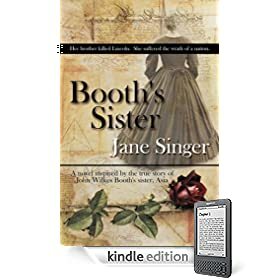 Download this free historical fiction “Booth’s Sister” (a $10 value) by Jane Singer. This book has gotten good reviews, and I wanted to share it with you while it’s FREE for a limited time. I found this book because it’s in the top 10 Bestsellers in Kindle Store. To get the iPhone app, go to http://www.apple.com/iphone/appstore/ and search for "Kindle for iPhone"
Hi, thanks for the link but there seems to be a problem when I click on the link for the Iphone it brings me to the download for PC. Any help would be appreciated. thank you! Hooray! Followed your links and downloaded Kindle for PC for free and now have 10 books all for free! Thanks! thanks for the link! I love getting stuff for free, especially books for my kindle!